Many countries in the New World and elsewhere celebrate the anniversary of Christopher Columbus' arrival in the Americas, which happened on October 12, 1492, as an official holiday. The landing is celebrated as Columbus Day in the United States, as Día de la Raza in many countries in Latin America, as Discovery Day in the Bahamas, as Día de la Hispanidad and Fiesta Nacional in Spain, as Día del Respeto a la Diversidad Cultural (Day of Respect for Cultural Diversity) in Argentina, as Day of the Americas in Belize, and as Día de las Américas (Day of the Americas) in Uruguay. These holidays have been celebrated unofficially since the late eighteenth century, and officially in various areas since the early twentieth century. In the latter part of the twentieth century opposition to Columbus Day grew, fueled in part by growing concern for the treatment of Native Americans by the European immigrants. The alternative Indigenous People's Day (also known as Native American Day) is now celebrated instead in several places. This desire to move beyond a Eurocentric view of American history reflects the increased social awareness of different cultures and ethnicities. Columbus Day was originally a celebration of the coming together of various cultures to create a new nation, but for many, the image of Columbus and his arrival in the Americas has become too narrow. Columbus Day first became an official state holiday in Colorado in 1906, and became a federal holiday in the United States in 1937, though people have celebrated Columbus' voyage since the colonial period. In 1792, New York City and other U.S. cities celebrated the 300th anniversary of his landing in the New World. Many Italian-Americans observe Columbus Day as a celebration of their heritage, the first occasion being in New York City on October 12, 1866. Columbus Day was first enshrined as a legal holiday in the United States through the lobbying of Angelo Noce, a first generation Italian, in Denver. The first statewide Columbus Day holiday was proclaimed by Colorado governor Jesse F. McDonald in 1905, and it was made a statutory holiday in 1907. In 1892, President Benjamin Harrison called upon the people of the United States to celebrate Columbus Day on the 400th anniversary of the event. The idea was to create a national holiday that would recognize both Native Americans and the many immigrants to the country, particularly Italians and other Catholics, who were arriving at that time. It was to celebrate all of American History, not just since the time of Independence or the Civil War. Teachers, preachers, poets, and politicians used Columbus Day rituals to teach ideals of patriotism. These patriotic rituals were framed around themes such as support for war, citizenship boundaries, the importance of loyalty to the nation, and celebrating social progress. Columbus Day celebrations reminded immigrants that they could preserve their own ethnic identities while simultaneously embracing the new nation. In April 1934, as a result of lobbying by the Knights of Columbus, Congress, and President Franklin Delano Roosevelt made October 12 a federal holiday under the name Columbus Day. The day was marked by parades, often including floats depicting the ships of Columbus, and by other public festivities. Since 1970, the holiday has been fixed to the second Monday in October, as part of the bill known as the Uniform Monday Holiday Act. Coincidentally this set Columbus Day on the same day as Thanksgiving in neighboring Canada (which was fixed to that date in 1959) (note that October 12, 1970, was a Monday). It is generally observed nowadays by banks, the bond market, the U.S. Postal Service, other federal agencies, most state government offices, many businesses, and most school districts. Some businesses and some stock exchanges remain open, also some states and municipalities abstain from observing the holiday. Actual observance varies in different parts of the United States, ranging from large-scale parades and events to complete non-observance. Most states celebrate Columbus Day as an official state holiday, though many mark it as a "Day of Observance" or "Recognition" and three do not recognize it at all. 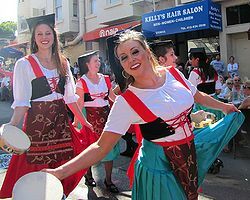 San Francisco claims the nation's oldest continuously existing celebration with the Italian-American community's annual Columbus Day Parade, which was established by Nicola Larco in 1868, while New York City boasts the largest. As in the mainland U.S., Columbus Day is a legal holiday in the U.S. territory of Puerto Rico. In the United States Virgin Islands, the day is celebrated as both Columbus Day and "Puerto Rico Friendship Day." Hawaii, Alaska, and South Dakota are the three U.S. states that do not recognize Columbus Day at all, though Hawaii and South Dakota mark the day with an alternative holiday or observance. Alaska celebrates Alaska Day on October 18. Hawaii celebrates Discoverers' Day, which commemorates the Polynesian discoverers of Hawaii on the same date, the second Monday of October. The state government does not treat either Columbus Day or Discoverers' Day as a legal holiday. Iowa and Nevada do not celebrate Columbus Day as an official holiday; however, the governor is "authorized and requested" by statute to proclaim the day each year. Opposition to Columbus Day dates to at least the nineteenth century when activists had sought to eradicate Columbus Day celebrations because of its association with immigrants and the Knights of Columbus. They were afraid it was being used to expand Catholic influence. By far the more common opposition today, decrying Columbus' and Europeans' actions against the indigenous populations of the Americas, did not gain much traction until the latter half of the twentieth century. This opposition has been spearheaded by indigenous groups. There are two main strands of this critique, which are interrelated. The first refers primarily to the indigenous population collapse and cruel treatment towards indigenous peoples during the European colonization of the American continents which followed Columbus' discovery. Some, such as the American Indian Movement, have argued that the responsibility of contemporary governments and their citizens for allegedly ongoing acts of genocide against Native Americans are masked by positive Columbus myths and celebrations. These critics argue that a particular understanding of the legacy of Columbus has been used to legitimize their actions, and it is this misuse of history that must be exposed. F. David Peat has asserted that many cultural myths of North America exclude or diminish the culture and myths of Native Americans. These cultural myths include ideas expressed by Michael Berliner of the Ayn Rand Institute claiming that Western civilization brought “reason, science, self-reliance, individualism, ambition, and productive achievement” to a people who were based in “primitivism, mysticism, and collectivism,” and to a land that was “sparsely inhabited, unused, and underdeveloped.” American anthropologist Jack Weatherford described Columbus Day as the day Americans celebrate the greatest waves of genocide of the Indians known in history. While giving the brilliant mariner his due, the collection portrays Columbus as an unrelenting social climber and self-promoter who stopped at nothing—not even exploitation, slavery, or twisting Biblical scripture—to advance his ambitions… Many of the unflattering documents have been known for the last century or more, but nobody paid much attention to them until recently… The fact that Columbus brought slavery, enormous exploitation or devastating diseases to the Americas used to be seen as a minor detail - if it was recognized at all - in light of his role as the great bringer of white man's civilization to the benighted idolatrous American continent. But to historians today this information is very important. It changes our whole view of the enterprise." The two criticisms of the celebration often appear together. Journalist and media critic Norman Solomon reflected in Columbus Day: A Clash of Myth and History that many people choose to hold on to the myths surrounding Columbus whereas historians who deal with the evidence are frequently depicted as politically correct revisionists. To support his position Solomon quoted from the logbook Columbus' initial description of the Indians: "They do not bear arms, and do not know them, for I showed them a sword, they took it by the edge and cut themselves out of ignorance.... They would make fine servants.... With 50 men we could subjugate them all and make them do whatever we want." Solomon stated that the most important contemporary documentary evidence is the multi-volume History of the Indies by the Catholic priest Bartolomé de las Casas who observed the region where Columbus was governor. In contrast to "the myth" Solomon quoted Las Casas who described Spaniards driven by "insatiable greed"—"killing, terrorizing, afflicting, and torturing the native peoples" with "the strangest and most varied new methods of cruelty" and how systematic violence was aimed at preventing "Indians from daring to think of themselves as human beings." The Spaniards "thought nothing of knifing Indians by tens and twenties and of cutting slices off them to test the sharpness of their blades," wrote Las Casas. "My eyes have seen these acts so foreign to human nature, and now I tremble as I write." Indigenous People's Day (also known as Native American Day) is a holiday celebrated in various localities in the United States, begun as a counter-celebration to Columbus Day. The purpose of the day is to promote Native American culture and commemorate the history of Native American peoples. The celebration began in Berkeley, California in 1992 as an alternative to Columbus Day. Indigenous People's Day is usually held on the second Monday of October, coinciding with federal observance of Columbus Day. In the years after Berkeley's move, other local governments and institutions have either renamed or canceled Columbus Day, either to celebrate Native Americans, to avoid celebrating actions of Columbus that lead to the colonization of America by Spanish conquistadors, or due to controversy over the legacy of Columbus. For example, in 2007, Dane County, Wisconsin, Supervisor Ashok Kumar replaced Columbus Day with Indigenous People's Day. South Dakota celebrates the day as an official state holiday known as "Native American Day" rather than Columbus Day. The date Columbus arrived in the Americas is celebrated in many countries in Latin America. The most common name for the celebration in Spanish (including in some Latin American communities in the United States) is the Día de la Raza ("day of the race" or "day of the [hispanic] people"), commemorating the first encounters of Europeans and Native Americans. The day was first celebrated in Argentina in 1917, Venezuela and Colombia in 1921, Chile in 1922, and Mexico in 1928. The day was also celebrated under this title in Spain until 1957, when it was changed to the Día de la Hispanidad ("Hispanity Day") and then again to Fiesta Nacional in 1987. In the U.S. Día de la Raza has served as a time of mobilization for pan-ethnic Latino activists, particularly in the 1960s. Since then, La Raza has served as a periodic rallying cry for Hispanic activists. The first Hispanic March on Washington occurred on Columbus Day in 1996. The name has remained in the largest Hispanic social justice organization, the National Council of La Raza. In Venezuela, Día de la Raza was officially established as a national holiday in 1921 under President Juan Vicente Gómez. In 2002, under president Hugo Chávez, the name was changed to Día de la Resistencia Indígena (Day of Indigenous Resistance). Since 1994, Costa Rica changed the official holiday from Día de la Raza to Día de las Culturas (Day of the cultures) to recognize the mix of European, American, African and Asian cultures that helped to compose Costa Rican (and Latin American) culture. Some Caribbean countries also observe holidays related to Columbus Day. In Belize, October 12 is celebrated as Day of the Americas or Pan-American Day. In the Bahamas, it is known as Discovery Day, and is also celebrated on October 12. The Fiesta Nacional de España (Festa Nacional d'Espanya in Catalan/Valencian; Festa Nacional de España in Galician; Espainiako Jai Nazionala in Basque) is the national day of Spain. It is held annually on October 12 and is a national holiday. It commemorates the anniversary of Christopher Columbus' first arrival in the Americas. ↑ Charles Speroni, "The Development of the Columbus Day Pageant of San Francisco," Western Folklore 7(4) (1948): 325-335. ↑ Kirkpatrick Sale, Christopher Columbus and the Conquest of Paradise (Tauris Parke Paperbacks, 2006, ISBN 978-1845111540). ↑ 3.0 3.1 William J. Connell, What Columbus Day Really Means The American Scholar. Retrieved October 14, 2013. ↑ 4.0 4.1 4.2 Timothy Kubal, Cultural Movements and Collective Memory: Christopher Columbus and the Rewriting of the National Origin Myth (New York, NY: Palgrave Macmillan, 2008, ISBN 978-1403975775). ↑ Today in History: October 12 The Library of Congress American Memory. Retrieved October 14, 2013. ↑ LBJ Signs Bill to Set Up Five 3-Day Holidays Sarasota Herald-Tribune, June 29, 1968. Retrieved October 14, 2013. ↑ 8.0 8.1 8.2 Conor Dougherty and Sudeep Reddy, Is Columbus Day Sailing Off the Calendar? The Wall Street Journal, October 10, 2009. Retrieved October 14, 2013. ↑ Italian Heritage Parade. Retrieved October 14, 2013. ↑ The Annual Columbus Day Parade Columbus Citizens Foundation. Retrieved October 14, 2013. ↑ Puerto Rico-Virgin Islands Friendship Day. International Holiday Calendar. Retrieved October 14, 2013. ↑ Legal holidays Leg1.state.va.us. Retrieved October 14, 2013. ↑ AS 44.12.010. Legal Holidays Alaska Statutes. Retrieved October 14, 2013. ↑ Hawaii Revised Statutes, Section 8-1.5 Hawaii.gov. Retrieved October 14, 2013. ↑ Nevada Revised Statues Chapter 236: Columbus Day Retrieved October 14, 2013. ↑ 1C.5 Columbus Day Iowa Legislature. Retrieved October 14, 2013. ↑ Indigenous People's Opposition to Celebration and Glorification of Colonial Pirate Christopher Columbus American Indian Movement, October 6, 2000. Retrieved October 14, 2013. ↑ F. David Peat, Blackfoot Physics: A Journey Into The Native American Universe (Weiser Books, 2005. ISBN 978-1578633715), 310. ↑ Jack Weatherford, Examining the reputation of Christopher Columbus Baltimore Evening Sun Reprinted by Clergy and Laity Concerned (CALC) / Westchester. Retrieved October 14, 2013. ↑ Meg Sullivan, 'Repertorium Columbianum' makes landfall UC Newsroom, University of California, October 6, 2004. Retrieved October 14, 2013. ↑ 21.0 21.1 Norman Solomon, Columbus Day—A Clash of Myth and History AlterNet, April 25, 2000. Retrieved October 14, 2013. ↑ Logan Jaffe, News: UW group offers alternative to Columbus The Badger Herald, October 9, 2007. Retrieved October 14, 2013. ↑ South Dakota Codified Laws 1-5-1.2. South Dakota Legislature. Retrieved October 14, 2013. ↑ Día de la Raza - Hispanic Day don Quijote. Retrieved October 14, 2013. All links retrieved March 13, 2017. This page was last modified on 13 March 2017, at 22:30.